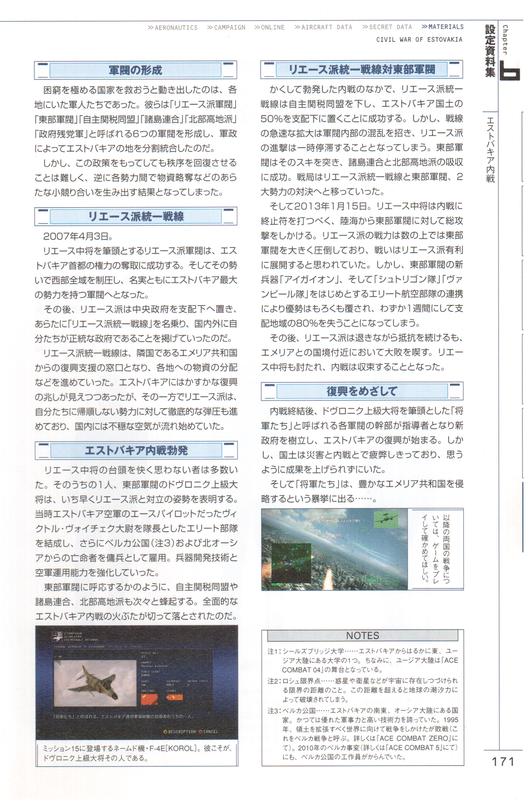 Three pages of the Materials section of the Ace Combat 6 Guidebook were selected for scan and translation by TaskForce 23. The information focuses on the Estovakian Civil War, the Aerial Fleet, and the Chandelier. Where possible screenshots from official Ace Combat websites were utilized to match or replace original scanned images with higher quality images. The curtain rises on this game’s story with a lightning-fast invasion by the Federal Republic of Estovakia on the Republic of Emmeria. What kind of nation is Estovakia, and why did this war occur? Let us explain by following the background step-by-step. Seals Bridge University [Note 1] discovered that an asteroid 1 mile in diameter was headed towards Earth. This asteroid, named Ulysses, passed the Roche limit [Note 2] 5 years later on July 3rd, 1999. July 8th of the same year, Ulysses shattered into over a thousand pieces along with countless particles and rained down towards Earth’s surface; in just two weeks it took over 500,000 lives. ​ The Federal Republic of Estovakia was one of the countries hit with catastrophic casualties from Ulysses. This country was a federation made up of multiple republics and had grown by redistributing resources and industrial products from each republic. However, its industrial foundation and infrastructure was destroyed by Ulysses. Supplying goods within the country became impossible and the citizen’s lives fell into poverty. In the disorder that ensued, politicians and bureaucrats escaped the country. As a result, all government functions in Estovakia stopped. Crime became rampant and the country became chaotic, overflowing with refugees. Taking very little damage from Ulysses, has now and always been a stable and flourishing country. The capital Gracemeria sits on geographically blessed land and many battles took place to claim control of the area during the Middle Ages over 600 years ago. The one who ended the history of fighting and stabilized Gracemeria is the famous “Golden King” Aurelius II. ​ The ones who sought to save the country from extreme poverty were the soldiers in various areas. They established 6 factions: the “Lyes Faction,” “Eastern Faction,” “Independent Tariff Federation,” “Island Coalition,” “Northern Highlands Faction,” and “Remnant Government Forces” which ruled as military governments over repartitioned regions of Estovakia. Even with this policy, it proved difficult to restore order. Instead, it resulted in factions looting goods from each other and spawned skirmishes throughout the land. The Lyes Faction - headed by Lieutenant General Lyes - succeeds in the capture of the Estovakian capital and thus, its authority. Using their momentum, they conquer all of the western regions and became recognized as the faction with the most influence in Estovakia. Afterward, the faction put the central government under their control and renamed themselves as the “Lyes United Front.” They would then proclaim domestically and internationally that they were the legitimate government of Estovakia. The Lyes United Front became the window to humanitarian aid from the neighboring Republic of Emmeria and proceeded to distribute goods throughout the country. There are slight signs of recovery from these efforts. However, the LUF had also been relentlessly oppressing those who did not submit to them and there was an air of unease within the country. There were many who did not think pleasantly of Lieutenant General Lyes’ rise to power. Among them, Colonel General Dvornik of the Eastern Faction sought to confront the LUF as soon as possible. 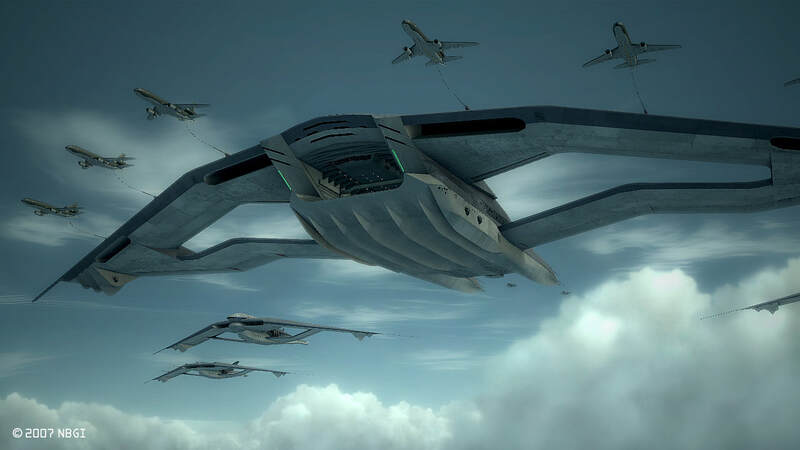 He organized an elite squadron led by Captain Victor Voychek, an ace pilot of the Estovakian Air Force. Additionally, he employed defectors from the Principality of Belka [Note 3] and North Osea as mercenaries. He was then able to strengthen weapons development technology and air force operations. 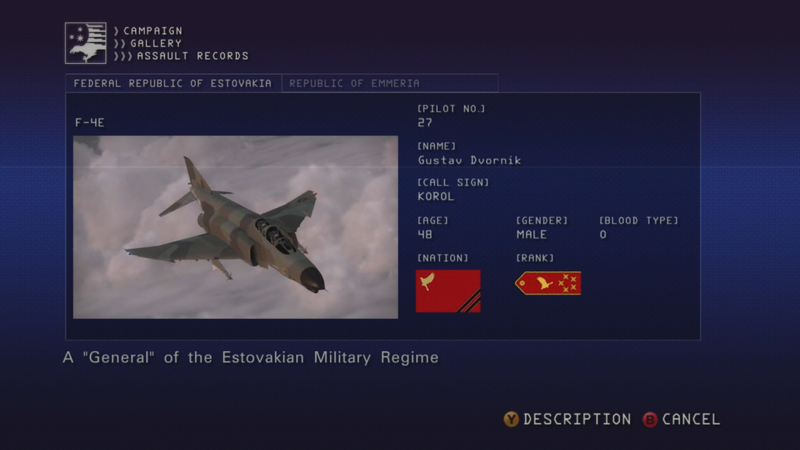 The named craft that appears in Mission 15: F-4E “KOROL.” This is Colonel General Dvornik himself. ​ At the outbreak of the civil war, the Lyes United Front defeats the Independent Tariff Federation and succeeds in putting 50% of Estovakia’s land under their control. However, the quick expansion causes confusion among their ranks and the LUF’s advance is temporarily halted. The Eastern Faction takes advantage of this and succeeded in integrating the Island Coalition and Northern Highlands Faction. The battleground shifted to a showdown between the two greatest powers, the Lyes United Front and the Eastern Faction. Then on January 15th, 2013, seeking to end the civil war with a decisive blow, Lieutenant General Lyes begins an all-out attack on the Eastern Faction from the land and sea. Compared to the Eastern Faction, the military strength of the LUF was overwhelming in terms of numbers, and the battle was thought to have been in the LUF’s favor. However, the Eastern Faction’s coordination between the new weapon, Aigaion and elite air squadrons “Strigon” and “Vampire” prove to be the superior force, and the LUF lost 80% of their controlled territory in just one week. Afterward, the LUF would continue to fight back while retreating but suffered a major defeat near the Emmerian-Estovakian border. Lieutenant General Lyes was defeated and the civil war was brought to an end. ​ After the conclusion of the civil war, “The Generals,” made up of top-ranking military officials with Dvornik as the head, take leadership, establishing a new government and beginning Estovakia’s recovery. However, the country was exhausted from the Ulysses disaster and civil war, and results could not be achieved as planned. ​For more on the war between both countries, we want you to play the game and find out. 1: Seals Bridge University – A university on the Usean continent, far to the east of Estovakia. 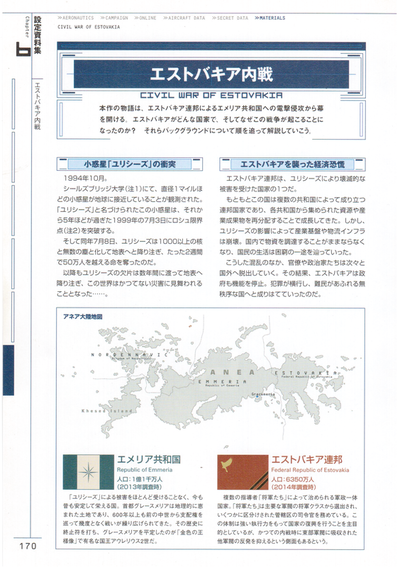 Incidentally, the Usean continent is the setting for [ACE COMBAT 04]. 2: Roche limit – The limiting distance at which asteroids and satellites can exist in space. Crossing this distance will result in them being destroyed the Earth’s tidal forces. 3: Principality of Belka – A country southeast of Estovakia, located on the Osean continent. Boasted superior military and industrial strength at one point. In 1995, they waged war on the world, seeking to expand their territory but was defeated (called the Belkan War. 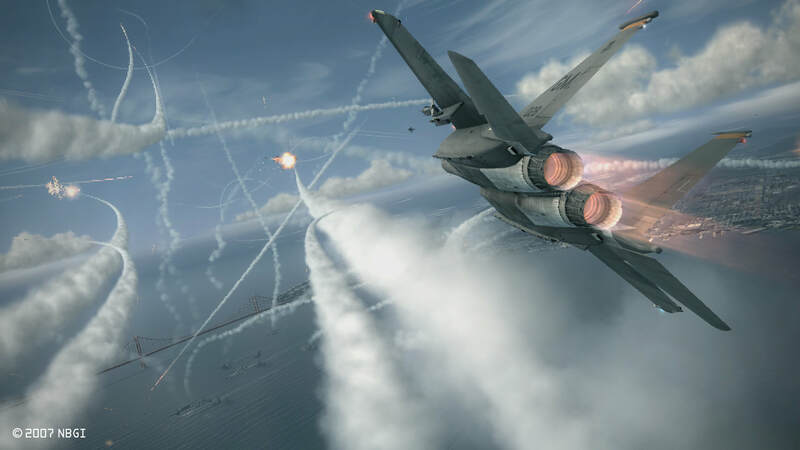 For specifics, see [ACE COMBAT ZERO]). 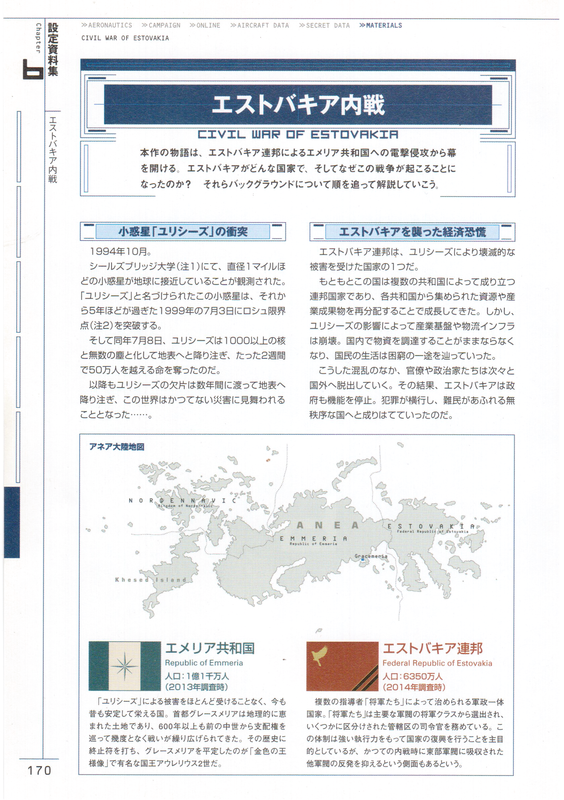 In the 2010 Belkan Conflict (see [ACE COMBAT 5] for details) agents from the Principality of Belka were also involved. ​ Estovakia has had friendly relations for a while with the Principality of Belka, and had taken in soldiers escaping war crimes, weapons developers, and business people seeking asylum after the Belkan War and Belkan Conflict. Among the Estovakians, Colonel General Dvornik had great interest in Belkan military technology and air force management. Using knowledge from the Belkans, he innovated ways of operating air power. He was able realize the “Aerial Fleet Initiative" (aka the P/F-X Program) which could establish air superiority over a massive range using long range attacks and airborne carrier operations and saw great combat success during the civil war. Aigaion’s hull is focused on long distance attacks, so is weak against close proximity attacks. However, Kottos and Gyges compensate for that. A super large aircraft that possesses the ability to launch, recover, maintain and resupply aircraft and equip launchers for the long range cruise missile “Nimbus”. Due to its sheer size, it cannot operate from normal runways and is resupplied via aerial refueling. 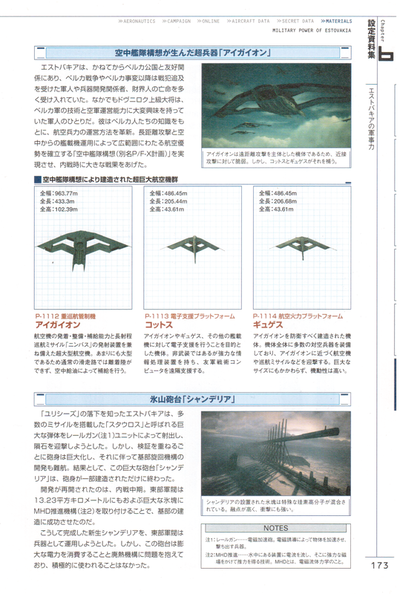 A craft whose purpose is to provide electronic support to Aigaion, Gyges, and other aerial craft. It is unarmed but possesses powerful data processing equipment and remotely supports friendly tactical computers. A craft built for the defense of Aigaion. Its hull is equipped with numerous anti-aircraft weapons and can intercept aircraft and cruise missiles that get close to Aigaion. Despite its large size, it has high mobility. 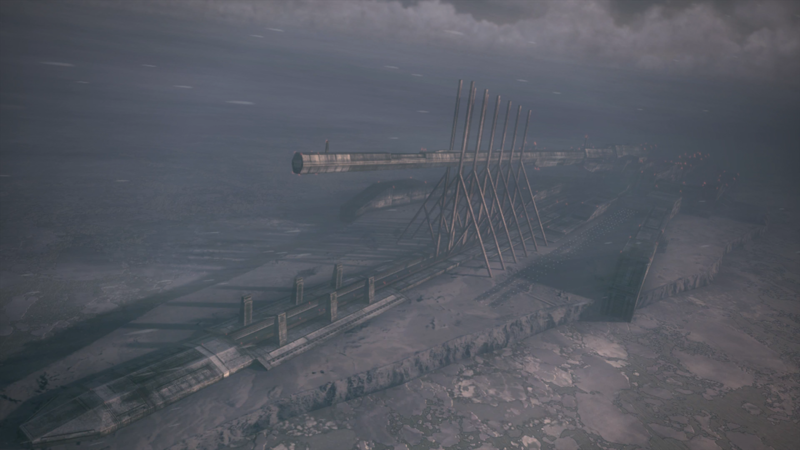 ​ Knowing the fall of Ulysses was coming, Estovakia sought to intercept the meteorites by loading multiple missiles in a giant shell called “Stauros” and launching those via a rail gun [Note 1] unit . However, the barrel had to be enlarged after multiple inspections and testing. In conjunction to this, building the base rotation mechanism proved difficult. As a result, building this giant gun battery “Chandelier” stopped with only part of the barrel being built. Development restarted around the middle of the civil war. By installing a MHD drive mechanism [Note 2] on an ice block 13.23 square kilometers in area, the Eastern Faction was able to succeed in building of the base. The Eastern Faction attempted to use the newly completed Chandelier as a weapon. However, the battery had problems with the enormous power consumption and the heat exhaust mechanism and did not see active use. The block of ice Chandelier was built on has a special mixture of silicon polymers. As a result, the melting point is lower and is resistant to impacts. 1: Railgun – Electromagnetic acceleration cannon. A weapon that utilizes electromagnetic forces to accelerate and shoot objects. 2: MHD Drive – Technology that uses strong magnetic fields created by running electric current through a mechanism underwater to gain thrust. MHD refers to Magnetohydrodynamics.